“Tractorcade Occupies the Mall,” Histories of the National Mall, accessed April 23, 2019, http://mallhistory.org/items/show/242. Hundreds of tractors paraded into Washington in February 5, 1979 to protest existing agriculture policies. The American Agriculture Movement organized this protest in 1979 after the 1st Tractorcade in 1978 did not bring changes they demanded. 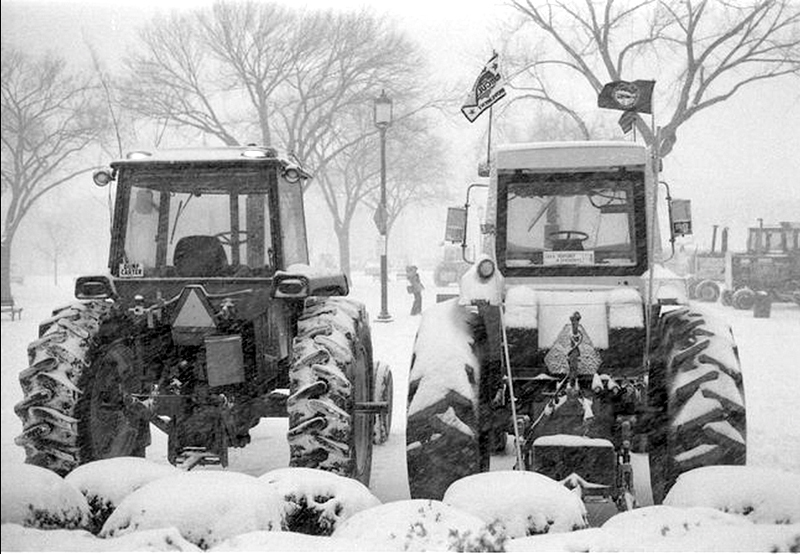 After slowly riding into Washington, the tractors were barricaded on the Mall where they had parked. Farmers stayed and occupied the Mall while police allowed tractors out for permitted demonstrations. Residents and Congressmen grew tired of the tractors and did not appreciate the damage caused on the Mall's grounds. When a blizzard shut down Washington on Presidents' Day, the occupying farmers helped the city by plowing streets, rescuing stranded residents, and transporting medical staff to hospitals. Residents grew more sympathetic to the farmers' cause after the snowstorm. By March 1, 1979, the tractors began leaving the city and the Mall's ground re-opened for public use.